PONSHOP Studio and Gallery is pleased to announce their October exhibition introducing the artworks of Maddie Huddle. Featuring a selection of oil paintings, her work transforms the ordinary into the unusual and invites viewers to reevaluate their perceptions of fine art. While named “Point of Entry” because it is her debut into the professional art world, the exhibition also acts as a gateway into the imagination of the artist herself. Maddie is a local artist and recent graduate of Virginia Commonwealth University’s Communication Arts department. More of her work can be displayed at www.maddiehuddleart.com. PONSHOP Studio and Gallery is excited to announce our March “First Friday” event rescheduled for March 13, from 6-10pm. 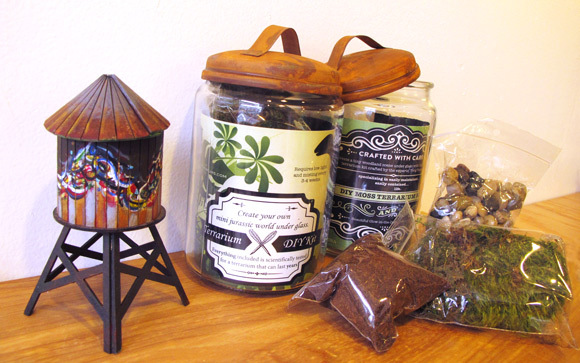 PONSHOP has designated March to be Do It Yourself month by introducing two new products to the shop: D.I.Y moss terrarium kits by Twig Terrariums and customizable miniature water tower replicas by Boundless Brooklyn. “Get Dirty” Terrarium Party: Get your hands dirty this First Friday and build your own terrarium at Ponshop Studio and Gallery on Friday, March 6 (6-8pm), using D.I.Y. kits by Twig Terrariums. Choose between the Jurassic World terrarium (including toy dinosaurs) or the Enchanted Moss terrarium (including glow-in-the-dark butterflies) and walk out with a completed and one-of-a-kind mini mossy world. $39 includes the terrarium kit as well as quick, guided assembly. Green thumb not required. Twig Terrariums is a Brooklyn-based studio and shop founded by artists Michelle Incinarrano and Katy Maslow, which houses a variety of made terrariums and do-it-yourself kits. Their D.I.Y. kits allow you to create your own mossy world with the provided earthly elements and easy to follow assembly and care instructions. 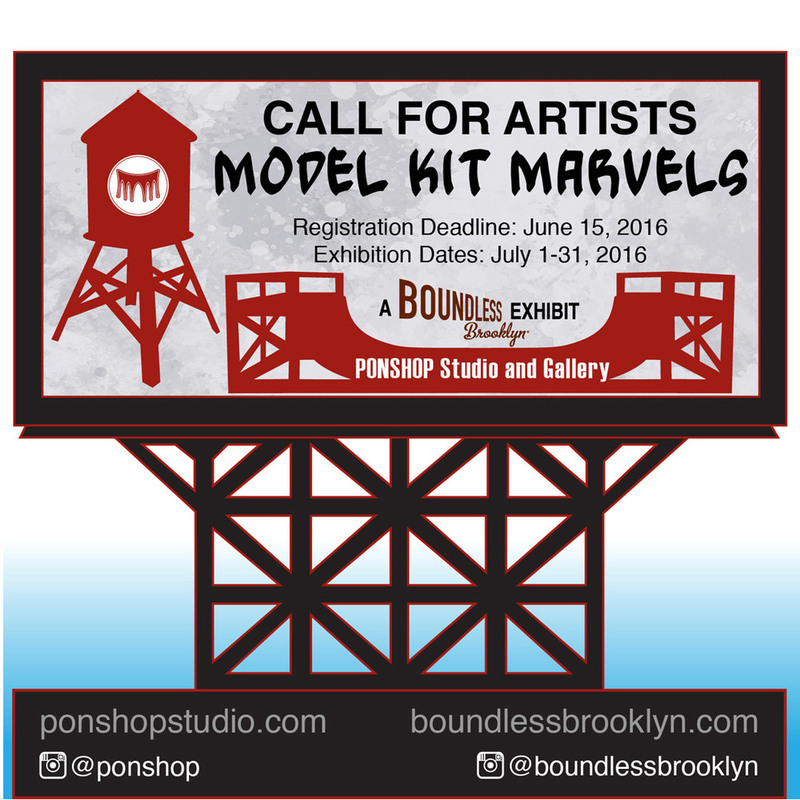 Boundless Brooklyn is another innovative company established in New York by friends David and Terence. They provide easy-to-assemble model water towers that allow you to add your own personal flair. Made out of 100% recycled material, these towers are great for all ages and fit perfectly on desks and shelves. Gabriel Pons will be hosting a build-your-own Brooklyn water tower workshop on Saturday, March 21 (1-3pm). Students will construct and paint a 10-inch tall cardboard replica of New York City’s most iconic structures. (Ages 9+) $35 includes (1) mini tower kit and all painting materials. More about Art Classes can be found HERE. Do not believe the misconception that if you cannot draw, then you are not artistic! In three 1.5 hour classes, students were introduced to various techniques, including collage, stenciling, ink, and more. From developing beginning ideas to executing mixed media artwork, instructor Gabriel Pons, guided students in strengthening the connection between the creative mind and hand. Students completed this course with a finished piece on canvas. Come join us at the PONSHOP with your ideas and we will supply all materials and instruction. Click Here to view our current class schedule. For further questions, contact PONSHOP. Local mixed media artist Leslie Brier has offered many workshops here at PONSHOP ranging from jewelry making, robot building, and assemblage art. By checking out the photo gallery below, you can see what happened last year including zen tangle drawings and recycled arts. In 2014, Brier has already shared her expertise on collage and assemblage techniques. Coming up in March are her jewelry courses on creating rolled paper beads and earring construction. Brier's courses are perfect for students of all skill levels interested in a one-hour workshop. Click Here to view our current class schedule. For further questions, contact PONSHOP. Cost includes all materials and you leave with your own one-of-a-kind art piece! PONSHOP Studio and Gallery is excited to celebrate the holidays with their annual small works show in December. The opening reception will be “First Friday” December 6, from 6-10pm. This year’s small works show will include new ceramic work by PONSHOP co-owner Scarlett Pons, who has created Fredericksburg themed mugs, Ramen bowls and ceramic ornaments in a variety of colors and patterns. Gabriel Pons will be releasing his latest T-shirt designs: the Octopus (green and white) and the “Hip Hop Origins” Tee. The gallery is also filled with new work from nine jewelers, four t-shirt vendors as well as handmade home accessories from local artists. Gift inspirations include limited edition art prints, custom painted skateboards, comic book wallets and plush toys. The gallery walls will include a group show of small works by featured PONSHOP artists including: Cameron Limbrick, Adam Desio, Steven Graham, Julie Maida, Crystal and Kevin Rodrigue, Stacey Schultze and James Walker. For our customer’s convenience, PONSHOP will have extended holiday hours Friday and Saturday from 10am–8pm, Sunday noon–5pm, and Monday through Thursday from 10am–6pm. PONSHOP Studio and Gallery is pleased to announce the “Live in Art” Showcase at Amelia Square (1099 Winchester Street, Fredericksburg). The opening reception is Saturday, November 9, 2013. This is an exclusive opportunity to view and purchase artwork for the home. PONSHOP is collaborating with Coldwell Banker Elite and Simply Home Builders, to host an exhibit in one of the recently constructed high-end brownstones at Amelia Square (located on the corner of Amelia and Winchester Street Fredericksburg). A select group of local and regional artists have been invited to participate in this event by contributing work that corresponds with the theme of the show “Live in Art” - reinforcing the residential nature of the project through professionally crafted artwork. Typically, the public views fine art in a gallery or museum setting. In this case, “Live in Art” features locally made fine art, ceramics and furniture where it resides once acquired – in the home. This is an opportunity to view and buy artwork in a comfortable and elegant setting and support the vibrant Fredericksburg art scene. The selected artwork is decisively contemporary, and includes signature pieces that fit the spirit of these new brownstones constructed in historic Downtown Fredericksburg. Gabriel Pons will be selling limited edition prints of one of the feature paintings from the show-a map of Fredericksburg that includes the entire historic downtown and the recent inclusion of the Amelia Square project. Scarlett Pons will be including an eight-piece ceramic dinner set to be included in the dining room. Local acclaimed furniture designer, Kaleo Kala will be exhibiting a new custom-built coffee table, and the walls of the home will be adorned with paintings from over ten artists. “Live in Art” will be featuring work by: Leslie Brier, Daniel Christie, Adam Desio, Ashleigh Dueker, Betsy Glassie, Bill Harris, Kaleo Kala, Rob Landeck, Patte Ormsby, Carol Phifer, Scarlett Pons, Gabriel Pons, Ana Rendich, Crystal Rodrigue, Kevin Rodrigue and James Walker. PONSHOP Studio and Gallery are pleased to announce that they will be hosting the third annual jewelry show for the month of November showcasing the work of nine jewelry artists. The opening reception is Friday, November First from 6-10pm. The jewelry exhibit features the works of Leslie Brier, Terresa Buelow, Matthew Cirello and Jasmine Lee as AMORDIVIN, Jodi Habel, Lisa Latendress, Trish Schornagel, Erica Voss, and Sylvia White. In keeping with the gallery’s format, the jewelry works in the exhibition are original pieces handmade by local artists. The exhibit will feature a wide variety of materials including upcycled items such as silverware and wine bottles, beads, leather, ceramics, sterling silver, copper, brass, hand-colored resin, precious metal clay, as well as sea glass and dichroic glass. The show will also include other jewelry works by Zakk Davis, Jeff Gulick and Courtney Fishback. This exhibit will serve as a great “sneak peek” for what PONSHOP will be offering during the holiday season. The gallery walls will include a group exhibition of featured PONSHOP artists including Nicholas Candela, Stephen Graham, Adam Desio, Crystal and Kevin Rodrigue, Gabriel Pons and more. The Jewelry Show exhibit runs from November 1 – 30, 2013.